PURPOSE: Implicated in at least 16 deaths worldwide and with a lifetime risk as high as 1 in 4000 cases of textured device implantation, breast implant-associated anaplastic large cell lymphoma (BIA-ALCL) has garnered increasing attention from researchers and the lay press alike. However, largely because of the lack of appropriate models, the pathogenesis of this devastating complication remains poorly understood. We have developed a three-dimensional biomimetic breast tissue platform to study patient-derived BIA-ALCL tumor cells. METHODS: Patient-derived breast tissue was processed, and all cellular constituents including adipocytes, organoids, and stromal vascular fraction (including immune cells) were used to populate an approximately 50μL three-dimensional type I collagen extracellular matrix in order to create multiple high-fidelity biomimetic breast platforms within 96 well plates. BIA-ALCL cells were seeded at a density of 200,000/mL homogenously within the platform and in wells that contained collagen alone without breast-derived cells. Platforms were imaged every other day using confocal microscopy, and images were processed using Imaris™ software. 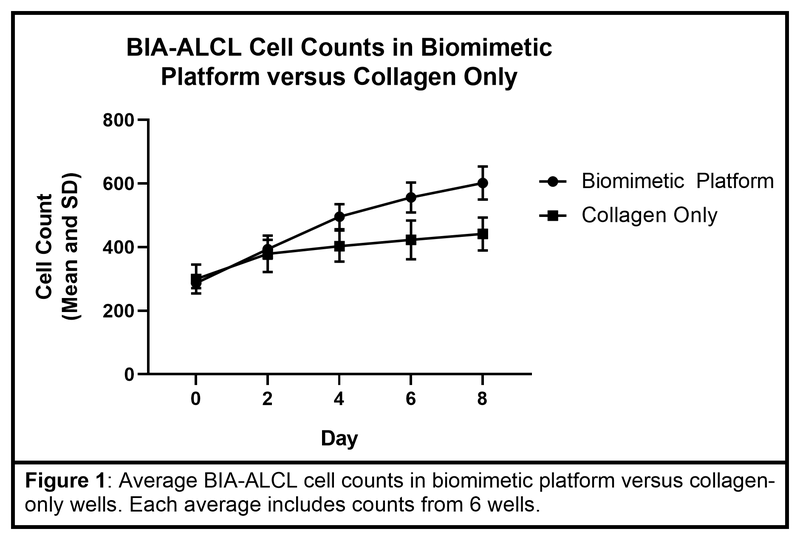 RESULTS: BIA-ALCL cells thrived in the biomimetic platform and grew significantly more rapidly than their counterparts in the collagen-only wells (Figure 1). CONCLUSIONS: We have developed the first three-dimensional biomimetic in vitro model of BIA-ALCL that we anticipate will allow for a better mechanistic understanding of this rare, poorly understood and potentially fatal complication of breast prosthesis placement.